Twitter has a memo for NBC News: Don't send Matt Lauer to do a political journalist's job. 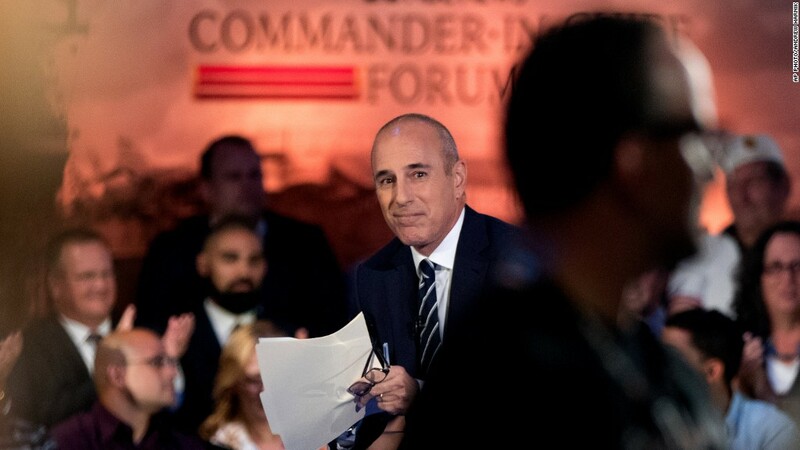 Lauer's handling of the NBC News "Commander-In-Chief Forum" with Hillary Clinton and Donald Trump on Wednesday night was widely panned by journalists and pundits. The "Today" show co-host was criticized for spending too much time on Clinton's emails, lobbing softball questions to Trump, and neglecting to fact-check the Republican nominee when he falsely claimed to have opposed the Iraq War in 2002. "This #NBCNewsForum feels like an embarrassment to journalism," New York Times columnist Nicholas Kristof wrote on Twitter. "Lauer has done great interviews. But that's one of the weakest, least incisive performances I've seen from a presidential forum moderator," tweeted Will Saletan, a writer at Slate. Liberals and conservatives were split about Lauer's decision to open his questioning of Clinton with the controversy over her private email server. But when the issue persisted ten minutes into the 30-minute segment, and he was later forced to tell Clinton to be "brief" on the subject of ISIS, he was slammed for dedicating so much time to the topic. But the onslaught of criticism didn't really begin until Lauer's segment with Trump. Whereas Lauer had been aggressive in his questioning of Clinton, he seemed to repeatedly ask Trump open-ended questions that he easily ignored or evaded. "I don't blame Lauer for asking the email question. But it's ABSURD that he started off with Trump, 'Why should you be Commander-in-Chief?'" Jon Favreau, the former speechwriter for President Barack Obama, wrote on Twitter. Early in the segment, Lauer failed to fact-check Trump when he said that he opposed the invasion of Iraq as early as 2002, a claim that has been repeatedly debunked as false. "Trump lies about opposing Iraq war. Lauer lets it go. No follow up. Unreal," wrote Jonathan Chait, the New York Magazine columnist. "Seriously -- everyone, and I mean everyone, knew this would happen," tweeted Paul Krugman, the New York Times columnist. "And Matt Lauer didn't have a follow-up planned?" Perhaps most notable were the questions Lauer did not ask of Trump. At an event geared toward national security and military veterans, the NBC co-host failed to ask a single question about Trump's controversial remarks about Gold Star parents Khizr and Ghazala Khan, Sen. John McCain's prisoner-of-war status or his deferments from the Vietnam War, among other issues. Meanwhile, Lauer was very aggressive in his questioning of Clinton's emails and her decision to support the invasion of Iraq. "If only Trump had attacked that Gold Star family in an email, then it would be newsworthy to Lauer," Paul Begala, the CNN analyst and Clinton loyalist, wrote mockingly. But the greatest criticism was that Lauer asked Trump too many softballs. "The way to show Trump isn't prepared is to ask him specific, detailed questions, not keep saying 'Are you prepared?' over and over," wrote Chait. "Dear TV anchors. It's been 15 months. Change interview style for trump," wrote Tim Miller, a former spokesperson for Republican presidential candidates Jeb Bush and Jon Huntsman. "He needs: Yes/no qs. Multiple specific follow ups on topic. Trivia." NBC spokespeople did not respond to a request for comment regarding Lauer's performance, or why Chuck Todd, the network's political director and host of "Meet The Press," was not asked to moderate the forum.